Audio launch of Ilaiyathalapathi Vijay's Puli is all set to happen on August 2nd but before that the team is planning to promote the album by releasing a shorter version of the song 'Yendi Yendi' which is crooned by Vijay and the film's heroine Shruthi Haasan. 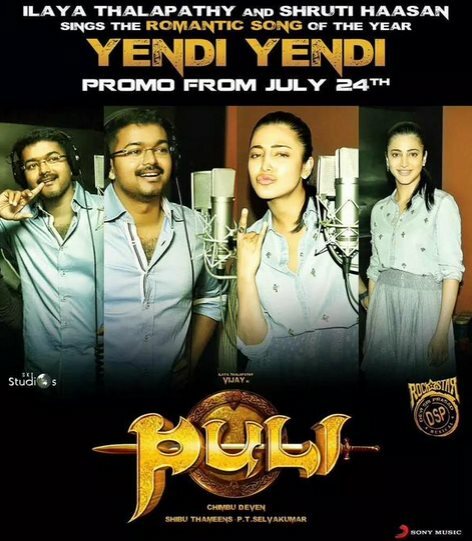 The promo of ‘Yendi Yendi’ will be unveiled on July 24 by Sony Music South who is holding the audio rights of Puli. Devi Sri Prasad has composed all the songs in the film while veteran lyricist Vairamuthu has penned the lyrics. Billed as a fantasy action thriller, the film is being directed by Chimbu Devan and has an ensemble of star cast including Hansika, Sridevi, Prabhu, Sudheep and Nandita Swetha.